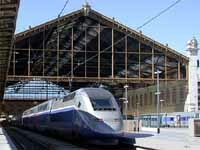 We drove to Perpignan, dropped off the car, took a train to Narbonne, and transferred to another to Marseille. 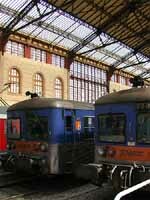 After buying tickets for our next train, we got to our hotel, Le Petit Nice, at about 4 PM. 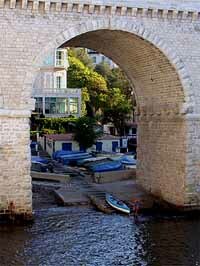 We settled in and then walked along the Corniche J. F. Kennedy, the coast road, toward the Vieux Port (old harbor). We stopped along the way at a Sofitel Hotel and sat in the lobby with a glass of wine, enjoying the view. We could see the outer harbor and, in the distance, the Chateau d'If, a former fortress and prison whose most famous prisoner was the fictional Count of Monte Cristo. We continued on to the Vieux Port, visited as early as 600 BC by Greek sailors. The port was packed with fishing boats, bobbing up and down in their berths. We recalled that this was the setting for Marcel Pagnol's "Fanny" trilogy. We spent some time walking in the port and the adjacent area; but there simply wasn't enough time to get a real feel for Marseille, the third largest city in France. Much of the city is beautiful, with steep narrow streets, quiet squares, wild night clubs, gardens, 18th century facades, modern architecture, and all the noisy, bustling French drivers. 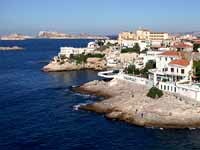 Marseille has been likened to bouillabaisse soup: "steamy and pungently spiced, with a little of everything thrown in. What it may lack in architectural unity or social sophistication is more than offset by its vibrancy and openness." We hope to return someday to fully savor this mysterious city. After a modest dinner at L'Entrecote du Marseille, we returned to the hotel.